Steelworkers vote overwhelmingly for strike authorization | Fight Back! 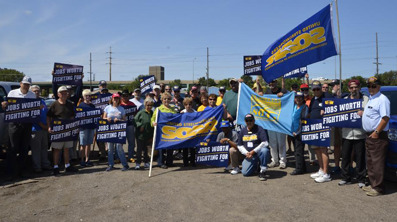 U.S. Steel employees represented by United Steelworkers (USW) voted overwhelmingly in favor of a strike authorization, Sept. 7. USW has been negotiating a master agreement with U.S. Steel that covers more than 16,000 workers around the country. The vote would grant the negotiating committee the power to call a strike against the company. U.S. Steel is proposing a number of concessions, including cuts to workers’ take-home pay and jobsite safety standards. These cuts come after a projected yearly profit of $2 billion and more than $50 million in management bonuses since 2015. The contract, which expired on Sept. 1, has been extended and can be terminated with 48-hour notice. The union is simultaneously negotiating a contract with ArcelorMittal, the world’s largest steel producer, based in Luxembourg. Proposed concessions from ArcelorMittal include cuts to wages and “safety nets” designed to help workers in the event of layoffs and plant closures. The master agreement represents approximately 8000 employees. A strike against U.S. Steel would be the biggest steel strike since 1986. The steel strike of ‘86 lasted for six months.